The report, written by Feroz Ali, Sudarsan Rajagopal, Venkata S. Raman and Roshan John, is available on the accessibsa website under Creative Commons licence, along with the data upon which the report is based. By researching trends in innovation and access to medicines in India, Brazil and South Africa, accessibsa “expands access to life-saving medicines for those most in need,” according to the website. Achal Prabhala, accessibsa convenor and fellow of the Shuttleworth Foundation, joined Suerie Moon, director of research of the Global Health Centre at the Graduate Institute of Geneva, for a webinar on 16 October to discuss accessibsa research and findings on Indian patents. The webinar, entitled “A New World Patent Order: An analysis of granted and rejected biomedical patents in India – with implications for Brazil, South Africa and beyond,” was the first of a new series organised by the Knowledge Network on Innovation and Access to Medicines, a project of the Global Health Centre. Prabhala opened the webinar by describing why accessibsa was formed. “We wanted to fill missing gaps in information, in policymaking information primarily, through research, through analysis, and to find ways that we could push that work out, not just in academia, but also publicly, to have a real public dialogue about some of our findings, and some of the shortcomings of the current system,” he said. He then went on to detail some of the findings of accessibsa reports, and how their conclusions have implications for patent reform in India, South Africa, Brazil and beyond. The range of accessibsa reports can be found here. “Evergreening” occurs when “pharmaceutical companies file secondary patents as a strategy for extending their market exclusivity of the drugs” beyond primary patents, to delay “the entry of generic versions of the drug,” according to the accessibsa report. Prabhala explained in the webinar that the patent law implemented in India in 2005 to comply with World Trade Organization obligations “came with a twist.” At the time, parties from across the political spectrum formed a coalition government, with broad representation, that “created a patent law that had higher and different standards to practically any other system around the world,” he said. This 2005 patent law retained the strong anti-evergreening provisions – 3(d), 3(e) and 3(i) – of the 1970 Indian Patents Act, restricting “the patentability of a host of secondary patents, i.e., new forms of known substances, new property or new use of known substances, use of known processes, admixtures without synergistic effect and methods of treatment,” according to the report. In the renowned 2013 Novartis case, “the Indian courts unwaveringly upheld the legal provisions [of 3(d)] and rejected the patent application for Novartis’ cancer drug imatinib mesylate [Glivec]. But the manner in which these anti-evergreening provisions were applied by the Indian Patent Office (IPO) while examining other pharmaceutical patents are unclear,” the report explains. In 2013, the Indian Supreme Court “laid down certain principles to overcome the objections under section 3(d),” known as the “Novartis Standard,” the report explains. Compliance with these standards “would require: (a) Demonstration on the part of the applicant to include efficacy data either in the specification/affidavit; (b) Determination and recording the reasons in a written order by the Controller,” according to the report. 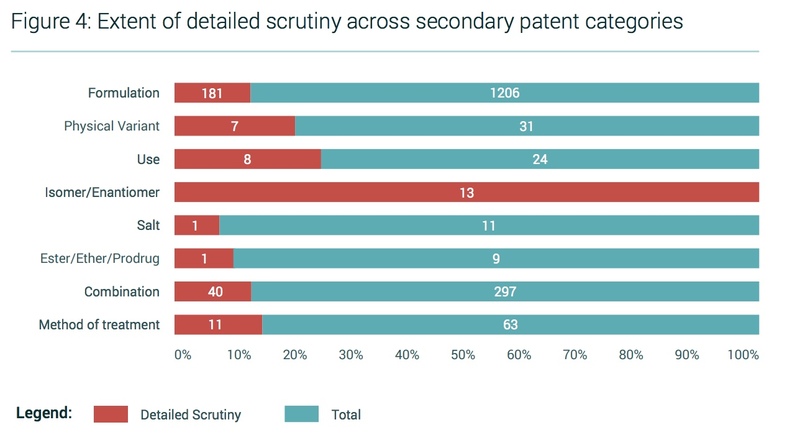 The report then analyses “the 249 granted secondary patents that were subjected to detailed scrutiny” and identifies the ways that they overcame the anti-evergreening provisions. The remaining 1405 secondary patents, however, did not have “any detailed written order,” in contravention to the Novartis Standard, so the researchers could not gauge exactly how these patents “bypassed the anti-evergreening provisions,” according to the report. Upon combining the 40 percent of pharmaceutical patents rejected by the Indian Patent Office with the 72 percent of granted patents that should have been rejected, the study finds that the Indian Patent Office should overall be rejecting 90 percent of pharmaceutical patent applications in compliance with Indian Patent Law, Prabhala explained. 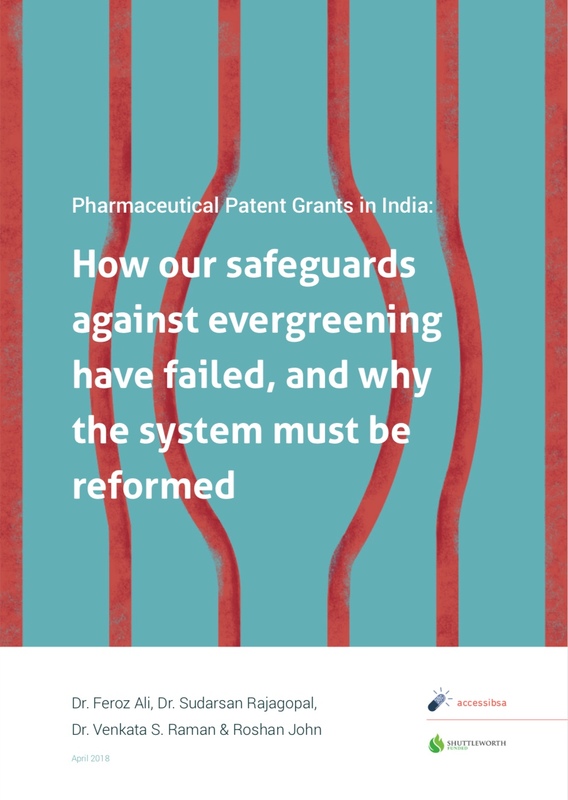 "Research Group Identifies Over-Patenting Of Pharmaceuticals In India, Calls For Patent Reform" by Intellectual Property Watch is licensed under a Creative Commons Attribution-NonCommercial-ShareAlike 4.0 International License.